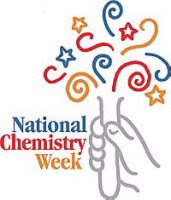 From October 19-25th the American Chemical Society celebrates National Chemistry Week. This year's theme is "Having a Ball With Chemistry", and the official site links to chemistry-related activities and games for kids. I'm not sure why the chemists were asked about their favorite food and color, but I suppose that kids would find details like that interesting. The interviews are also available in Spanish. Find a local national Chemistry Week event.